There is (and always has been) a sort of frenzy about getting a tax refund. The discussion almost always revolves around the refunds individuals look forward to and get after filing their tax return on April 15. But what about small businesses? Can they get a refund the same way individuals can? 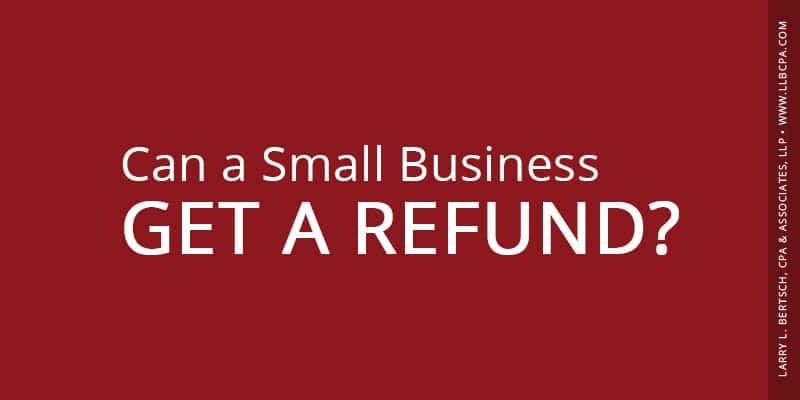 In this article, we will discuss how a refund works for a small businesses. We will also discuss how a refund is generated and why a refund for any taxpayer may not be the best tax accounting strategy. Any discussion of small business taxation (and its effect on a potential refund) begins with the form a business chooses to operate and how it chooses to be taxed. If you are curious how this works, please read the following article: How Are Businesses Taxed? What follows regarding small business refunds flows from an understanding of that discussion. All businesses are required to report their profit or loss on a tax return. Any business that is structured so as to pay taxes on its profit can potentially get a refund. The only type of business that falls into this category is a Regular or C Corporation that files a Form 1120. Very few small businesses take this form so a discussion of that process is beyond the scope of this article. Most small businesses operate as either a sole proprietorship or as what is known as a pass-through entity (partnerships and S Corporations). There is also the Limited Liability Company (LLC) which can choose how it is taxed (usually as a partnership but also as a sole proprietorship in the case of an LLC owned by an individual). While these entities all report their profit or loss on their specific tax returns, all of that profit and loss is taxed at the individual level on Form 1040. These entities, in and of themselves, are not required to pay income taxes, so they cannot generate a refund. Any potential refund is therefore generated at the individual level. In its simplest form, a refund is generated when the amount a taxpayer has withheld for taxes and/or the estimated tax payments they have made for the year is more than the amount of tax they owe for that year. Employees who work for a company have taxes withheld on their earnings, and that is how their taxes are paid. In most cases, it is simply a matter of comparing the withheld amount with the tax owed, as mentioned above, and either getting a refund or owing more tax at the end of the year. On the other hand, a taxpayer who owns a sole proprietorship or a single member LLC, or who is a partner in a partnership or a shareholder in an S Corporation, pays taxes on their share of the profit of the business. Typically, the owner does not get paid a salary for which taxes are withheld (although this can be the case in an S Corporation), so the taxes have to be paid in another way. Since the IRS works on the pay-as-you-go method, the taxes still have to be paid throughout the year. This is done through estimated taxes. A small business owner must make estimated tax payments on April 15th, June 15th, September 15th of the current year, and January 15th of the following year for the tax year in question. The total of these tax payments, in addition to any withholding that may have occurred due to a spouse’s wages, for example, are, again, compared to the amount of taxes owed, and if more, a refund is generated. What Happens if I Don’t Make Estimated Tax Payments? If estimated taxes are not made, a large amount of taxes and possibly penalties will be due on April 15th (sorry, no refund). And remember that in all of these instances (except for shareholders of an S Corporation) the owner is also subject to self-employment tax which is approximately 15% if the profit of the business over and above the regular income tax. The owner must know the income of the business as of those dates (at a minimum) and estimate what the year-end profit will be so that the calculation of an estimated tax payment for income and self-employment taxes can be made. Only in this way can a potential refund be generated. Related: How Will the New Tax Law Affect Business Owners in 2018? Is Getting a Refund Good Tax Planning? We have become so conditioned over the years to get a refund on our taxes. The IRS has set up the pay-as-you-go system so that they can generate sufficient cash flow to operate the government. And, of course, they are always interested in getting as much as they legally can. Because taxes are withheld, it is not always clear how much is actually being paid until it is too late to do anything about it. On top of that, every year there are numerous advertisements telling tax payers to get their refund by tax preparation companies. While getting a refund check may seem great, do you really want to use the IRS as a savings account? What Is Proper Tax Planning? Proper tax planning involves estimating the amount that will be owed on April 15th from all sources, including a small business, and then making sure that either a taxpayer’s withholding or estimated tax payments (or both) are just enough to cover the taxes owed and avoid any potential penalties. Theoretically, then, the refund should be zero, giving the taxpayer the use of that money throughout the year. Even the miniscule amount of interest offered by a savings account is better than no interest from the IRS. But there may be better uses. Just keep in mind that the refund is your money; think about how and when you want to use it and plan accordingly. A discussion of refunds wouldn’t be complete without a looking at loans offered against a refund. This is the worst tax planning of all. The interest rates charged on such loans are very large and can significantly reduce the amount of tax savings a taxpayer is entitled to. While the activities of a small business contributes to the overall refund or additional taxes a taxpayer will experience, there can be many factors that must be taken into account. No business transaction or operation should be entered into solely for tax reasons. All factors must be accounted for, and if, by the way, there is a tax benefit, then so much the better. Savvy small business owners work with a competent professional, such as a Certified Public Accountant or Enrolled Agent, to plan for the success of their business and the resulting tax consequences. Such a professional can work with the business owner to maximize profits and plan for and legally minimize taxes, taking into account all of the taxpayer’s financial matters and then properly manage the cash flow that results from using the money throughout the year rather than waiting for a refund.